Disclosure: I got this product, PURE Glass Water Bottle, as part of an advertorial. Today I am showing off the World’s Safest Water Glass. Intrigued? 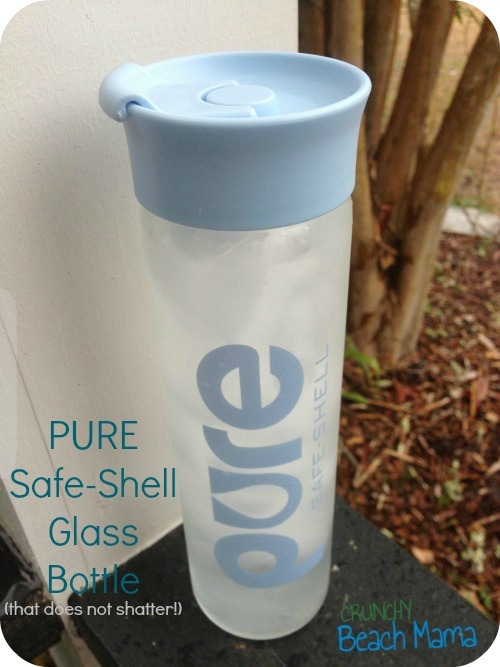 PURE Safe-Shell makes a bottle that will NOT break into pieces. A little history on glass from their website – the first glass was delivered from the heavens in spectacular fashion when lightning struck sand. The heat from the lightning bolt formed natural tubes of glass. Some time later, around 3500 BC, man replicated this natural occurring phenomenal. Glass is naturally chemical and BPA-free so really is an awesome solution when thinking about our health. Keeps drink in the PURE-st form when it comes to taste – no yucky metallic or plastic taste. 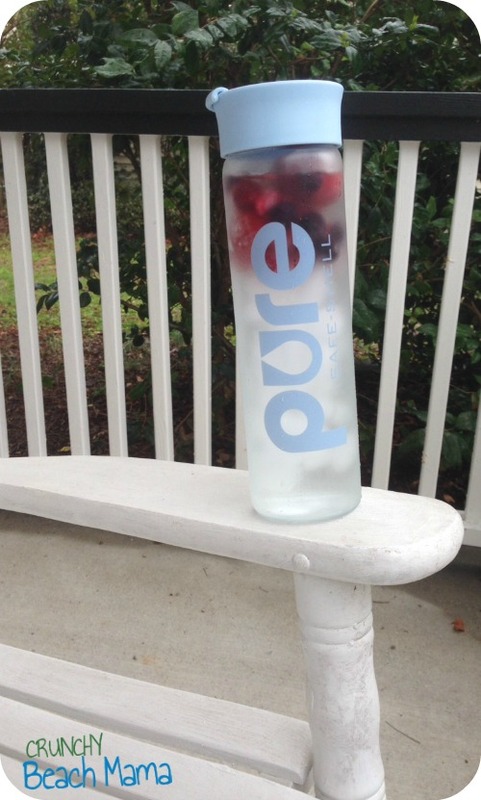 Now what makes PURE bottles the best? 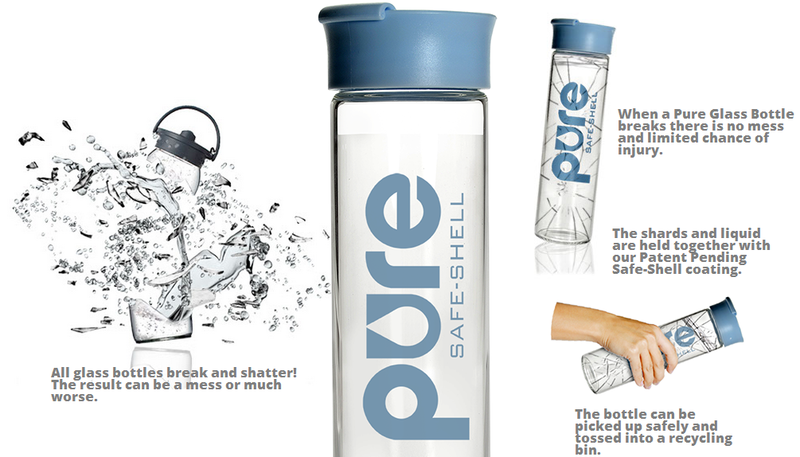 PURE bottles are made from tough to break Borosilicate glass that can withstand high impact. And here’s the best part, should the glass ever shatter, the Safe-Shell coating keeps all the shards contained so less chance of injury. The bottle is 100% recyclable, you simply throw the entire bottle into your recycling container if it does break. PURE bottles come with a wide mouth opening that allows you to add ice cubes, fruit wedges, tea bags, and other flavorings. It also makes the bottle much easier to clean. The bottle contains no liner inside, only 100% natural glass! P’Diddy has claimed the kid size one. He totes it around from morning school to putting it on his bedside table at nap. If he drops it, he will remain SAFE! You can buy Pure Glass Bottle at their website ~ there are a few styles! Would you love a PURE Glass Water Bottle? I received this water bottle for review. All opinions are my own. I would like to try the Pure Glass bottle it sounds interesting. I think I would like using this glass bottle - it would be my first. I've always avoided glass beverage bottles because of the breakage concern - this one may be the one that changes my mind! Thanks so much for letting us know about it! I like the how well though out this bottle is and the nice shape. Lately I've become more aware of the nasty taste that plastic cups etc tend to have and more concerned about the chemicals that might be leaching into the family's drinks! I've been wanting to switch to either a metal or glass and this one definitely looks like it MIGHT survive a household with a toddler! I like the idea of a shatterproof glass bottle. I like the idea that you can see if you have cleaned it well enough. I like that it has a large mouth making it easy to clean. I am always looking for ways to get away from plastic! love the look of this bottle! I am very intrigued to use a glass bottle! I have been wanting to get away from plastic! Yes, tired of the plastic taste in my water! the bottle looks great. you always think of glass as breakable. doesn't look like this one is thanks for the giveaway. Yes, I would love this glass bottle. The more I read about how plastics are bad for us, the more I would prefer glass! I appreciate that the bottle has a more generous opening. 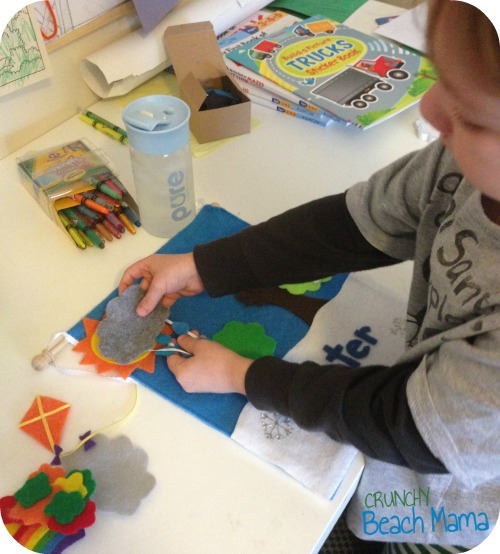 It is often difficult to clean smaller bottles, requiring special brushes or very tiny hands. I'm very intrigued to use the glass bottle! I am tired of my plastic bottle. Thanks for the giveaway. I'm interested to see if the water tastes better than it would from a plastic bottle. I think replacing my plastic bottle with this would be great! I love how these look! I want one! I think it is better to use glass bottle. I love reusable water bottles, glass is even better! But one my 2 year old can't break?! I'm sold! These look amazing. I find us switching out our reusable plastic bottles far more often than I would like. This would be great to try instead! I have started to use glass for drinking. But I don't have a fancy drinking glass that is shatterproof. I would enjoy this very much. I cannot even stand the thought of drinking water from plastic anymore. This is even better, because if it is dropped it will not leave glass shards behind! Yes I like it! Trying to increase my water intake. I would love to have one of these bottles...no more worries of chemicals leaching into my water from plastic. I think a glass water bottle is safer than plastic, and easier to clean. Would love to win one! I've been wanting to get my boys glass water bottles for school, but was afraid of them breaking into a million pieces. This one looks perfect! Wow, it looks like an awesome water bottle! More folks need to use these and keep the plastic bottle waste down! Thanks so much for the chance! Yes, I want to see what this is all about! I am very intrigued about these glass water bottles. I have tile floors throughout most my house, so many glass items get broken it's sad. I wonder if one of these would survive a drop to the tile floor in my house and sound like even if it didn't it wouldn't be the horrific mess to clean up. I just lost a glass pie plate to a over helpful toddler just this week. Luckily he didn't get hurt but that glass was a huge debris radius. Yes i am intrigued to use a glass water bottle. Definitely something I'm interested in trying. I've used Nalgene bottles for years, but a little nag in the back of my mind is worried about the effects of plastic on my health. I use mason jars or old kombucha bottles to carry water. Always worried about dropping and breaking them. Would love to try this and have less worry! Love that it doesn't shatter everywhere. Would love to win this, haven't been brave enough to have glass bottles around! Yes, I am intrigued by these glass water bottles that seem so much safer. yes... I have a stainless steel bottle. This concept is interesting to me because we have a tiled kitchen when anything glass falls shatters everywhere. I also like the idea that the opening is wide enough to put tea bags or fruit in for flavoring. I have an obsession with glass bottles...I don't know why, I reuse the Voss bottles often I would love this bottle!!! I'd love to have a glass water bottle!!! No more plastic!!! I am intrigued to use a glass bottle! I would totally use this daily! Yes, I think using a glass water bottle would be a really "cool" idea!! Thanks for the giveaway!! Always wanted a glass bottle for water that I didn't have to worry about dropping! I like glass bottles because the contents always taste better to me... Like a cleaner, crisper taste. I used to drive from Phoenix into Mexico just to cross the border to get the Mexican Coca Colas in glass bottles. I used an old glass bottle for years. I'd love to have a new one. I have been afraid to carry a glass water bottle because I am clumsy. I was always afraid of it shattering. I AM intrigued to use a glass water bottle. I actually haven't seem much out there (besides baby bottles). They sound awesome! Absolutely! We've switched to mostly glass for our tuperware-like containers, and I'd love to go that way with water bottles, too! That is very interesting and looks good too! I am a water drinking fool! Would love to try this! I like the "safety-feature" built into this glass bottle. It would make me feel more comfortable having my daughter use it. I am very intrigued. I have been hearing more and more good about glass compared to plastic. Yes i think that this is so pretty. Something about using a glass water bottles feels so clean & pure! We have been using and reusing the two glass water bottles I have, I like the idea if this breaks it will not shatter which I think is very important, I fill our bottles daily with our well water and they work well. I am interested to see what this can do! I am, think it will be easier and better to clean than other bottles. I liked it, plus you can carry around and helps you to drink water or more healthy things. this would be perfect for my daughter,so she can take it to the school. I hate drinking out of plastic and that it's hard to really get clean. I drink out of mason jars most of the time, LOL! A bottle like this would be great for when I'm on the go! I am intrigued! It would be nice to know that no plastic chemicals or taste would be in my water. I have been using a glass water bottle for a few years, but am always afraid of dropping and breaking it. I love the thought of using a glass water bottle! My only fear would be breaking it! I absolutely love this bottle!! I love that it has a coating that prevents shattering, safety is always the biggest concern with glass! I do not like plastic bottles at all. Would love to try this one! This sounds like a great option. We use glass for pickles and pasta sauce, why not our drinking water? Much better than plastic disposables. I would love to see how this holds up at our house, since i am soo clumsy and my kids can be super destructive sometimes! I'd like to try a glass bottle. Currently using BPA free plastic and stainless steel. Thank you for hosting the giveaway! We have not tried one but would love to with all the toxic ones that are out there we have to be careful. Sounds like something I would love. I am intrigued especially because it won't break! We have a water filtration system in our home and several water bottles that we fill each day for all of us. I drink a minimum of 8-10 bottles of water a day but they are all plastic of course. I would love to have a glass one that wasn't fragile. Thanks for the chance to win! I'd love to try a glass water bottle! Interesting..... I'd really appreciate this I encourage my family to drink as much water as possible. This is a great tool to assist. I don't like the taste of plastic. Glass should be good. I have a glass travel coffee mug because I'm super aware of toxins and trying to eliminate as many as possible. I'm so glad I found this post because this bottle is perfect for kids (and me). Excited to try it! this seems like a good idea, less toxic chemicals leaking into the water. love it! I made the switch to glass tupperware containers, and I use mason jars for everything that I can, but I've been too terrified to try a glass water bottle -- 'til now! This bottle will worry me much less, and our tile floors won't get to mess with me! Bother. You will have to eliminate my entries as I live in Canada. I love these bottles! The fact that they are easy to clean is a definite plus. And I can't abide plastic. I like drinking from a glass cup. Drinks always taste better in glass. I would love to use a glass water bottle! I really like the way they look! Ok, that is just AWESOME! I have always been afraid to try a glass bottle but seeing that one and how it wouldn't break into a million pieces I want to try it! yes, its better than plastic! I'd like to use a glass water bottle just for the ease of cleaning it! Thanks for the chance to enter! I am interested in it because it's a healthier option than the plastic. I am because it seems healthier than other plastic products on the market. i would like to try it, especially since it says it won't shatter....i am clumsy. I just read an article this morning how BPA free plastic still contains estrogen and releases harmful stuff into the food/beverages and is still very much dangerous. So now I am really interested in switching our house over to glass and stainless steel! It would be interesting but I drink water all day long and prefer to drink out of glass than plastic. Thank you for the giveaway. I'd love to drink out of glass. I would love to win this. I have been wanting a glass water bottle. Thanks for the giveaway! Glass is my PREFERRED container of choice b/c it doesn't leave aftertaste like other materials can. I LOVE this bottle. Adding to my wishlist! I would love to try a glass water bottle. We take our own water bottles when we have to run errands. Right now, we use stainless. I love drinking water from a glass, so this would be a nice change! I would love to win this bottle. I drink a lot of water during the day and it looks like this water bottle would be easy to clean. This is certainly a clever glass water bottle. It has some great improvements over standard glass bottles. I am slowly replacing all my water bottles with glass or stainless steel ones. I would love to try this one, I like the lid. This looks very interesting. I am trying to find something other then plastic bottles. THESE SOUNDS AWESOME. I'D LOVE TO TRY THEM. Sounds neat! I would like to see if the water tastes a lot better than a traditional plastic bottle! This looks very interesting and I'd love to try it out! Would love a glass water bottle. My Mom has one. Love the glass bottle idea. So much better than plastic. Thanks for the giveaway. Really cool! My husband really needs one to carry at work! I would love to have a pure glass water bottle. that looks like a really cool glass bottle. I'm so curious to see how fragile it is! I really like the look! I have one similar that is for tea but doesn't work well for water like this one. Definitely would use a bottle like this. looks really cool and fun! This would be great for helping my and bump to be stay hydrated this simmer! This bottle is so cool! I am intrigues, never used one. I glass water bottle sounds great to use and easy to clean. I try to use only glass bottles but they are usually old Kombucha bottles so would like a nice one! I would love a glass whether than a plastic water bottle. I'm very interested in using a glass water bottle. I've recently started using essential oils, and they aren't supposed to be used with plastic. This would give me a great opportunity to try something new. Thanks for the giveaway! I have a glass bottle but it has a silicone wrap on the outside. I need a glass water bottle! I never used one before but it sure does look pretty! I would love to try this bottle, it seems really nice. That looks really cool! Is it weird that I want to break it just to see what it does? But I wouldn't, it just looks neat. Great way to have the glass that I prefer! I am interested! I've heard a lot of good things! I would love to use a glass water bottle but would be afraid it'd shatter. Thanks for the giveaway…love that it is glass, not plastic !